Yesterday Bernie Marsden was kind enough to bring his legendary 59 Burst aka "The Beast" to visit at the Birmingham UK JB gig. Bernie is a great player, a great guy and this is a great Burst! Here's a few pictures of it for you all. for someone to play it that much!!!! it must have tone for days. i would rather see/play a burst like this, over a closet classic any day! That's just terrible. He needs to get it repainted. A number of coats of marine pant would be a lot more durable. I was at the show and it truly did sound amazing. Great tone! Bernie played well too, was playing a PRS singlecut of some kind through a Marshall Vintage Modern combo from what I could see. Joe really hit it out the park though, superb performance as usual, it was great to see him. Very cool! One of my faves with that lovely figuring! Killer thread...thanks as always Mike! Awesome!! Thanks for posting Mike!! Thanks Mike. That looks like it has done some duty. Beautiful. Thanks for those pics, Mike! Does Bernie still own The Beast? I saw the guitar a few years ago at a Dallas show. And btw - I saw Bernie jam with Paul Reed Smith and some others at the recent Frankfurt Musikmesse. He sounded great - even without the Beast! Beautifully beat! Absolutely love it! Beautiful pictures !!! Thanks for posting !! 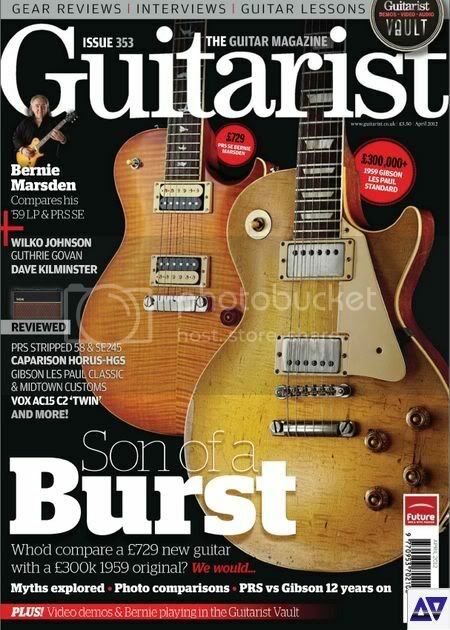 For those of you who want to know more The Beast and Bernie are the coverstory on Guitarist Magazine april 2012 issue. they have an interesting soundclip comparison between the Beast, Bernies signature PRS SE and Gibson LP Classic Custom. I just went to the shop and got it, thanks for the heads-up! Missed this first time around.Thanks Mike,way cool Burst.Mike B. Cool! Thanks for the link! Bernie seems like a cool dude. That tone! Always been my favorite 'Burst. Just the right amount of flame and grain. And that beautiful fade...just doesn't get any better than that. So glad to hear he still has it. I didn't think that was the case. Always makes me sad to hear of players who sold their 'Bursts and now likely don't have the money to buy them back (or another). I'm sure we've all got guitars in our past that we had to sell to make ends meet at the time (or for whatever reason)...only to regret it later. Now THAT is great looking burst, Must be a real player to have such beautiful scars. Love the looks AND the tone. Every time I see a video with Bernie, he just comes across as such a nice fellow and a content soul. Really does. That burst kills, and quite frankly so does Bernie. Was that once cherry sunburst? If so, it's pretty wild how much it's faded into almost a butterscotch by now. Yeah, I don't think it was ever the brown/tobacco color. Frankly, I'm glad Gibson used the "wrong" dye at first. I love seeing the potential variations before they changed to the more colorfast dye in mid-'60. The videos seem to show more of a honeyburst. Very cool.